Circular or semicircular arrangements of stones probably appeared by 2500 BC, the earliest being pairs of four-ton bluestones (their colour when wet) now known to have been brought about 250 miles from the Preseli Mountains in South Wales. Moving this quantity of stone over such a long distance would have been a considerable undertaking. It is still unclear why these particular stones were deemed to be so special. Also added: features called Station Stone, and the Heel Stone just outside the northeast entrance. Stonehenge gained its iconic shape with the creation of the 16-foot-high Sarsen Circle–30 worked stones topped by lintels. In a horseshoe configuration inside the circle towered five freestanding trilithons, each formed of two upright stones linked by a lintel. The tallest reached 25 feet. Each stone weighed more than 25 tonnes and had to be transported over 30km (19 miles). It was also an incredible task to erect the stones, secure them together with sophisticated joints, and shape their rough surface with stone hammers. Some of the stones have carvings, looking like daggers and axes. It is also during this period that the Avenue was built. The chalk bank was recut, small circular earthworks were added, and a banked avenue ran nearly two miles to the River Avon. 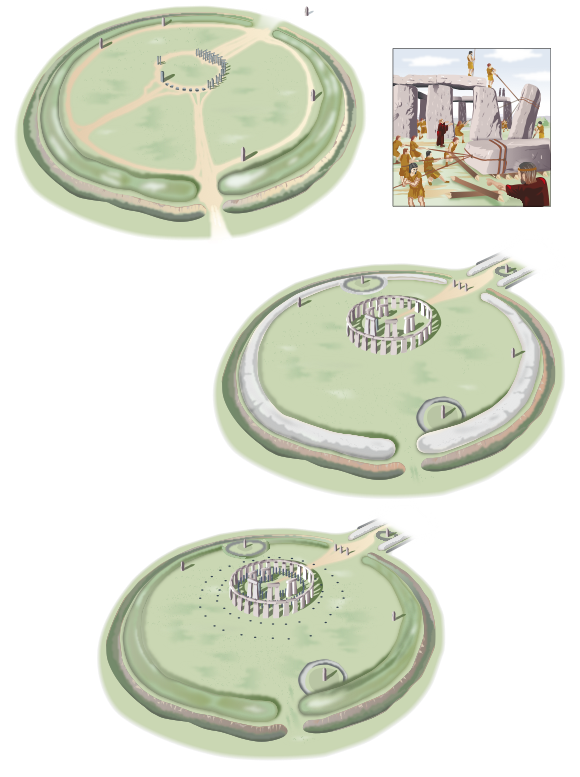 Bluestones that had been cast aside were repositioned as a circle and a horseshoe within the Sarsen Circle, and a double ring of pits was dug. The circle originally consisted of about 60 stones, and few of them now remain. The horseshoe was made of blue stones shaped as square pillar or obelisk. Its focus was the Altar Stone, now fallen, which would probably have stood upright. By about 1500 BC Stonehenge was no longer maintained.